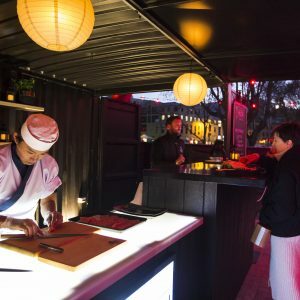 In our third year as a major supporting partner of Tasmania’s Dark Mofo, we’re bringing even more to the table this year! 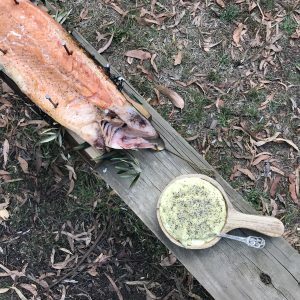 At the Winter Feast you can look forward to seeing not one, but two chef collaborations from the Huon Salmon crew. Here’s a taste of what you can expect! For the last two years we’ve brought our good friend Masaaki up from Geeveston in the Huon Valley to showcase our Huon Salmon with his extremely popular Japanese menu. Masaaki’s flame grilled Aburi and fresh Tasmanian wasabi is always extremely popular and his beautiful fresh Huon Salmon Nigiri a close second. 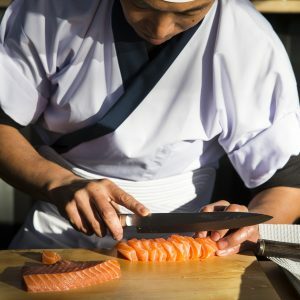 Masaaki will also be adding his miso soup with Wood Roasted Huon Salmon flakes which will be a delicious way to warm up during the cold Tassie nights of the festival. 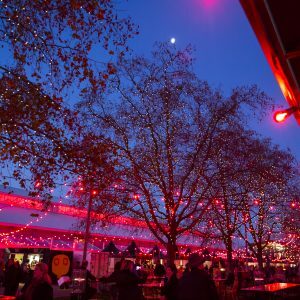 This will be Bente’s first time at Dark Mofo and the Huon Salmon crew are excited to be bringing something new to you this year! Originally from Denmark, Bente has been in Australia now for over twelve years and recently left her long-serving position as Executive Chef at popular Melbourne eatery, Denmark House. 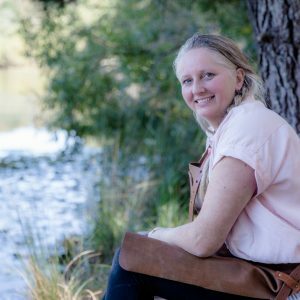 Bente has recently embarked on a new business venture as she harnesses the power of nature and beauty of outdoor cooking. Bente also shares our philosophy of nose-to-tail and will be showcasing the full use of Huon Salmon during the festival. “We are not alone on this planet and out of respect we have a duty to make damn good use of everything we kill from nose to tail. When you hear the term nose to tail, most people think pork, beef, lamb etc. but ‘nose to tail’ should be adapted as a way of life, into all the produce we use including salmon”. 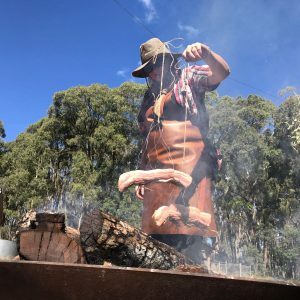 Watch Bente nail fresh Huon Salmon fillets to wooden planks and roast them over an open fire pit. The plank Huon Salmon will also be served with freshly Hot Smoked Huon Salmon which will be smoked on site each night during the festival. This will then be topped with Tasmanian pepper berry aioli from the Huon Valley and our very own Huon Salmon Caviar. The frame, head and tail of the Huon Salmon will be burnt over the coals before being used to infuse a hot vegetable broth. There is going to be a lot of action going on with this collaboration so we encourage you to come and join us outside and take it all in! Bente may just inspire you to try it at home for yourself! “Being in Nature and cooking with fire makes me feel grounded and ‘at home’. I feel connected to something much greater than myself, my Viking ancestors perhaps. Cooking outside and reconnecting with Nature provides me with clarity and courage. Enough to have left commercial kitchens after 25 years, for a much simpler life filled with fire and fresh air, where food is a true tribute to Nature.